George Rodrigue makes a great King. 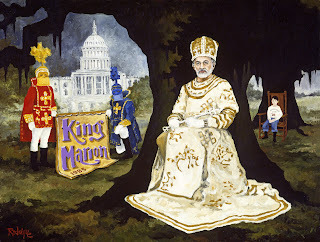 I hear it every year as we attend the Washington D.C. Mardi Gras, where he ruled in 1994 and still commands regal respect. 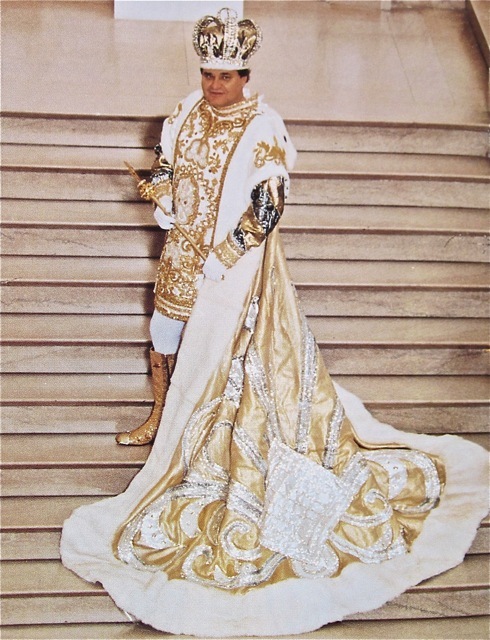 This royal interest started in his childhood, in the late 1940s. 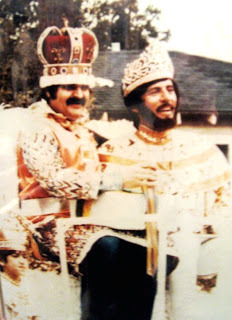 George’s first memory, in fact, is a fitting for his King costume during New Iberia’s Carnival. 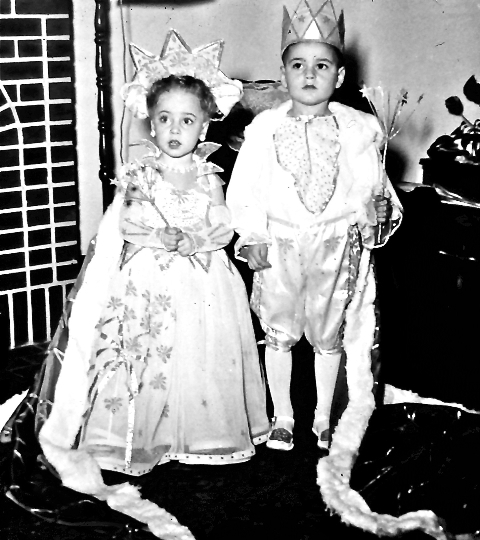 George’s mother and his older cousin Lillian made costumes, working on them all year. They entered George and Lillian’s daughter Arlene in the children’s carnival costume competition, which the kids won annually. Did you like it? I asked. “I didn’t have a choice!” he exclaimed. At age four or five, they dressed George as Robert Fulton (1765-1815), inventor of the steamboat. At age ten, George was a soldier in a white satin uniform. 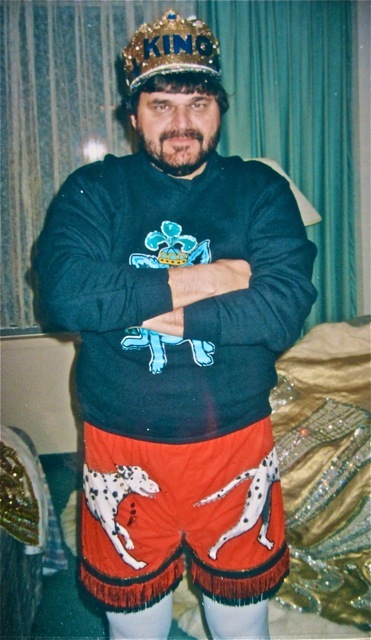 But more often, he was one half of a royal couple. 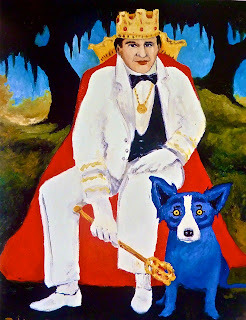 By the mid-1970s a thirty-year old George Rodrigue, now living in Lafayette, Louisiana, declared himself King. He built a platform in front of his house on Jefferson Street, where, dressed in full regalia, he and his dog greeted passing parades. Each year, Rodrigue made a gold medallion version of the doubloon complementing his royal attire, such as the image above, based on his classic oak tree and below, based on his bronze sculpture of Longfellow, Evangeline and Gabriel. 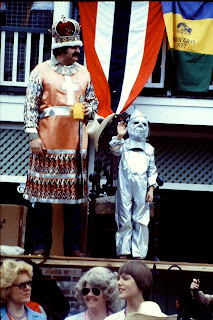 Guests arrived in costume and enjoyed gumbo and a cochon de lait. 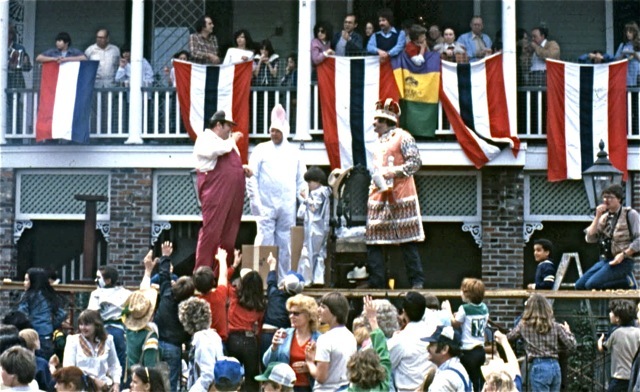 (click photos to enlarge; pictures include George's son Andre Rodrigue and friends Dickie Hebert as Wonder Woman and Ed Vice, on the stage as a rabbit). 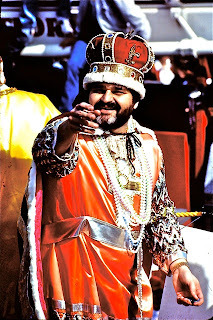 For George, the highlight each year occurred when the parade stopped at his platform, and the two kings toasted. One year, he climbed aboard the King’s float and presented a gift, a live chicken, which caused havoc among the courtiers. In 1992, George Rodrigue reigned for the first time as an official King, ruling for the all-female Lafayette Krewe of Xanadu. (pictured King George with Governor Kathleen and Raymond “Coach” Blanco at the Xanadu Ball; Coach taught George at Catholic High, New Iberia, and Kathleen would become Louisiana’s first female governor in 2004). 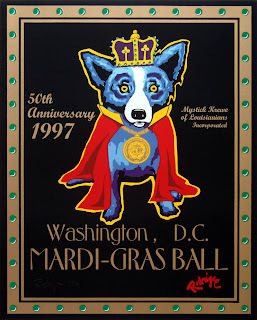 In 1994, George ruled as King of the Washington Mardi Gras (pictured above), a private Mardi Gras for 5,000 guests, hosted annually in Washington D.C. by the Louisiana Legislature. George is still heralded as one of the best kings ever. He broke many traditions, most famously choosing red satin drawers over the traditional white bloomers beneath his costume. In addition to his 1994 reign, Rodrigue commemorated the DC event in a painting not of himself, but of his friend Marion Edwards, who was King in 1985 (related post here). 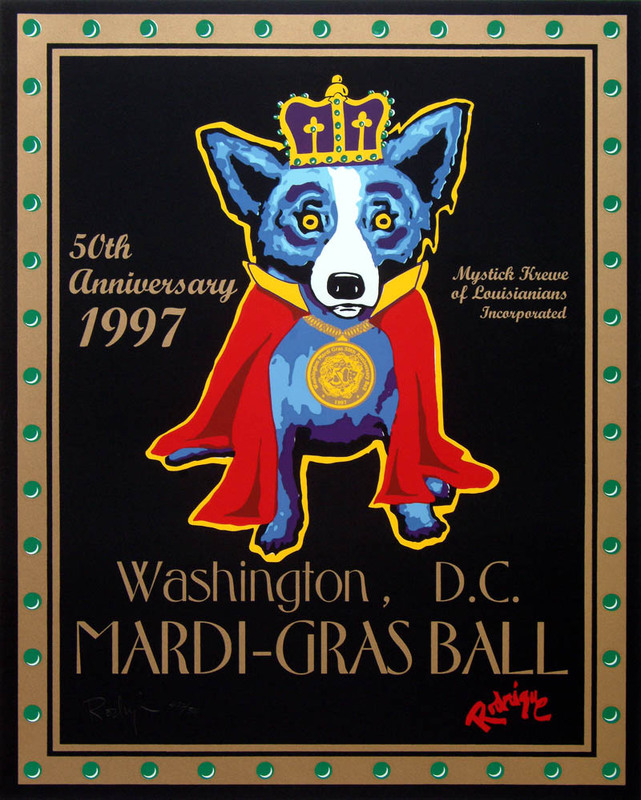 He again honored the event in 1997 with a silkscreen poster celebrating the 50th Anniversary of the Washington, D.C. Mardi Gras Ball. 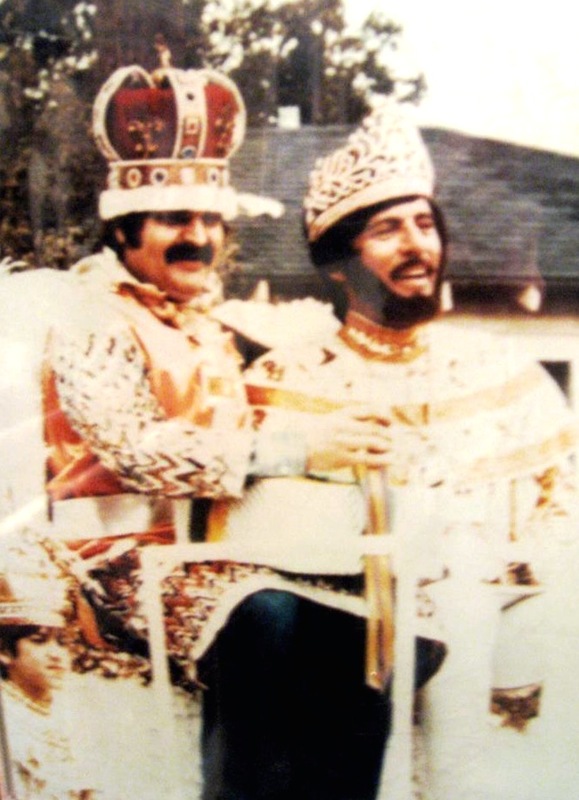 Since 1994 George has served as Grand Marshall or King for parades in New Iberia, Lafayette, Butte la Rose, Pierre Part and New Orleans. 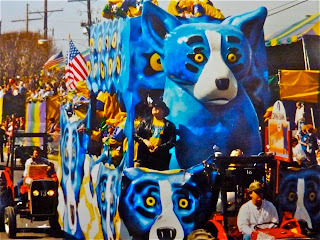 The highlight is the Argus parade in Metairie, Louisiana, where the Blue Dog float runs each year on Mardi Gras Day. 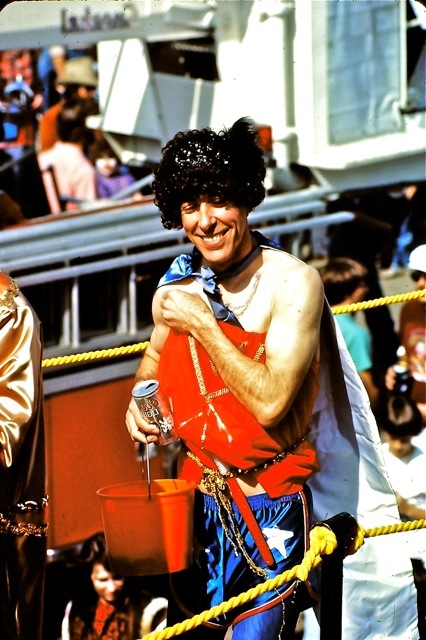 As Grand Marshall of Argus, George threw Blue Dog doubloons. 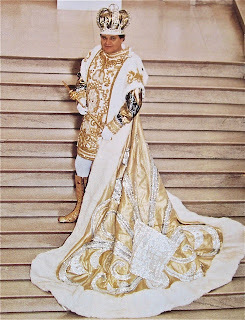 In 2004, he declared himself King once more, this time celebrating his 60th birthday. 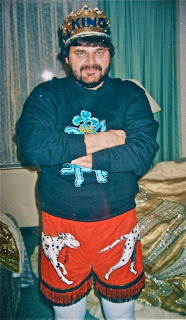 He grew a beard for the occasion and maintained a strict dress code for guests: Elvis “The King” or Marilyn Monroe. Would you be King again? I asked, not sure of his plans. Try as I might, however, even his other half received no answer…… only a laugh. Wish I was in Nola. The gallery is a must see on any trip there. 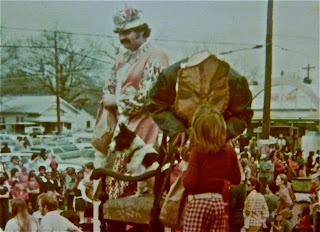 We had a contingent from Texas, known as the "Texas Wrecking Crewe" who attended Mardi gras in Lafayette. We had our own gold doubloons struck, by the same jeweler that did George's and some in aluminum for throwing to the crowd. In full Rodeo Regalia we stood with George and had a grand time. 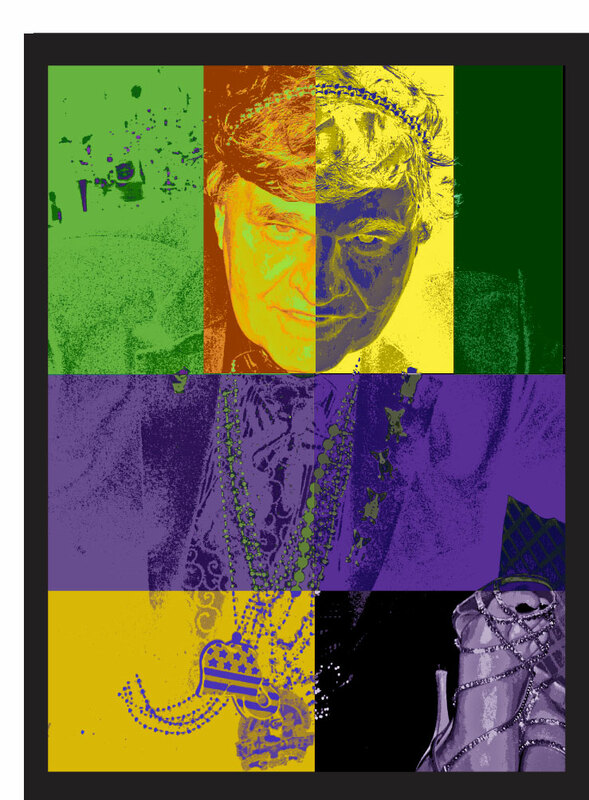 We loved Mardi gras in Lafayette.....The 'official' organizers always seemed somewhat standoffish....we were just having fun and intended no offense. 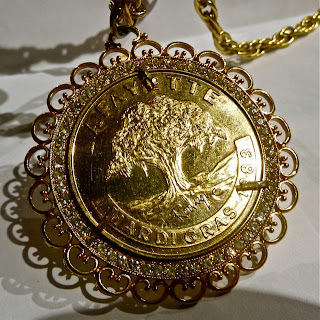 Later I realized our failure to pass a little lagniappe to the ‘proper people’ was probably the root of our problems. In all events George was our King and a grand one adored by the folks at the party at the Gallery and those who came by to shout, ‘Throw me something mister’….and we obliged. Luminaries such as the Lt. 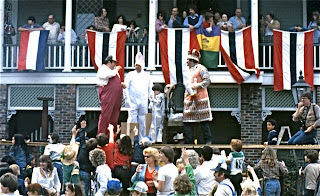 Governor, Mayor, senators and other officials, made the Rodrigue reviewing stand and party hard to ignore. 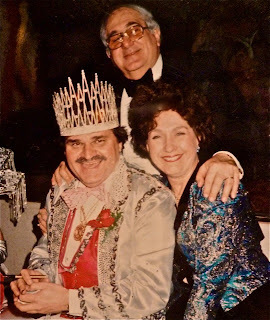 More important, we had the Mayor’s secretary Bertha Bernard, now on George and Wendy's staff. A grand time was had by all and if I understand correctly, that is the goal of Carnival. It was always a long drive back to Houston on Wednesday, but the sharing of great recollections made the trip worthwhile. Thanks for the memories George. Your comments add so much to the post, Jack! Thank you for sharing. 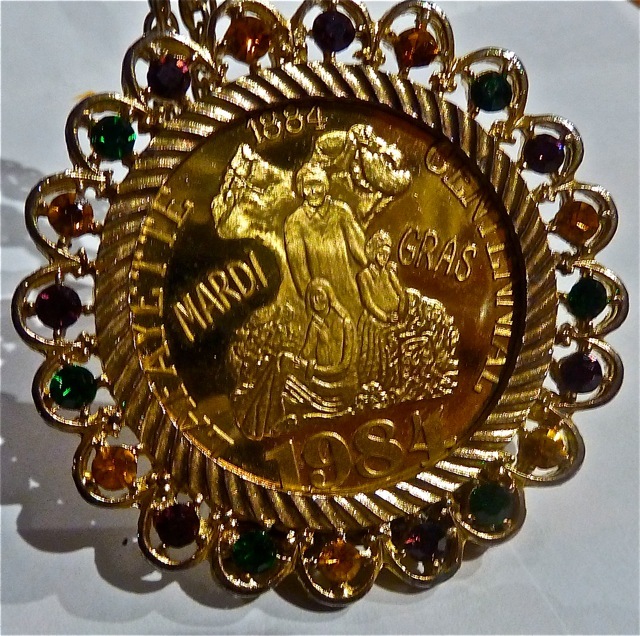 And Happy Mardi Gras!